Maybe SG's pocket is not deep enough but I can't see myself shelling out $1000 for this leather bracelet, although I do think it's fun in a stylish punk rock fashion, after trying it on myself. I feel I can find equally cute bracelets from other premium designers for half or one-third of the price, which is much savvier for the wallet. 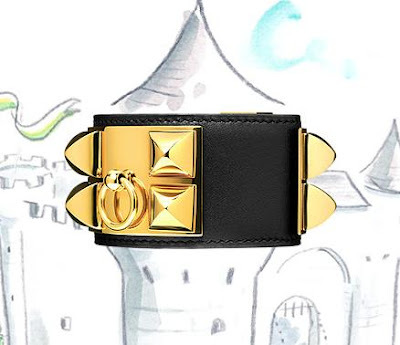 I don't mind paying for Hermes products, but this leather bracelet just does not call out to me. What about you, is it savvy or not so much for you? It must be good to be so filthy rich. Love the bracelet and but the price. it's definetely a very unsavy price!! I have a problem, so I don't know if I will be much help. If I love something so much, the price won't deter me, i'll tell myself it's too fabulous to pass up. It is a gorgeous bracelet. It not being classic makes the pricetag difficult for me. I'd love it if someone wanted to give it to me, however. I have a smaller Hermes studded cuff and never got to wear it much. I'm not Kate Lanphear, after all. thanks wendy for your experience. i think i will skip this and maybe get the enamel bracelet instead. the collier de chien is cute but $1000 is a little pricey.